(Nanowerk Spotlight) The invention of the wheel was one of the most significant events in human history. It has been at the origin of major scientific and technological developments: from the creation of astronomical clocks or calculating machines to motor-drawn vehicles and other motor cars. At the molecular scale, the smallest at which a wheel can be created, it represents a major challenge for chemists and physicists. For years, scientists have been working on the design of molecular machines equipped with wheels. After observing the random rotation of a flat molecular wheel in 1998, designing and synthesizing a mono-molecular wheelbarrow in 2003 and then synthesizing a molecular motor in 2005, a European group of researchers managed to operate the first molecular rack with a pinion of 1.2 nm in diameter. They controlled the rotation of a 0.7 nm diameter wheel attached to a 0.6 nm-long axle in a molecule. This molecular 'wheel' could revolutionize machinery built at the nanoscale. Nanowheel rotation has been claimed before, but never shown directly. So far manipulation of single molecules with a scanning tunneling microscopy (STM) has lead to a hopping motion of the molecules from one adsorption site to the next. This work, done by researchers in Berlin/Germany and Toulouse/France, is the first case of a rolling molecular wheel. "This is on one hand fascinating as it shows that rolling, a motion that is of fundamental importance in the macroscopic world, is also possible at the atomic scale" Dr. Leonhard Grill explains to Nanowerk. "On the other hand it opens the way to design a new class of nanomachines that are equipped with wheels." Grill, whose research group at the Free University Berlin focuses on the study of single functionalized molecules on surfaces, is first author of a recent paper that describes this rolling nanowheel ("Rolling a single molecular wheel at the atomic scale"). Grill's collaborators on the paper were from the Nanosciences Group at CEMES-CNRS in Toulouse. Grill and his colleagues show that triptycene groups, which resemble three-bladed paddlewheels, can act as wheels only 8 angstroms wide. They fixed one triptycene to each end of a rigid axle, then pushed this primitive molecular vehicle over a copper surface using the tip of a scanning tunneling microscope. The type of wheel and surface were very carefully chosen. Two notched, "tireless" wheels were used because of their maximum adherence to the running surface, an ultraclean copper plate. Its natural roughness presented rows of copper atoms separated by a distance of about 0.3 nm, and about one atom high. The way the molecule moves depends on how it is aligned to the row of copper atoms on the surface. In previous experiments molecules have hopped across the surface when pushed by the microscope tip. However, when the molecules aligned properly with respect to the ridges on the copper surface, one of the wheels rotates by 120° when pushed by an STM tip. 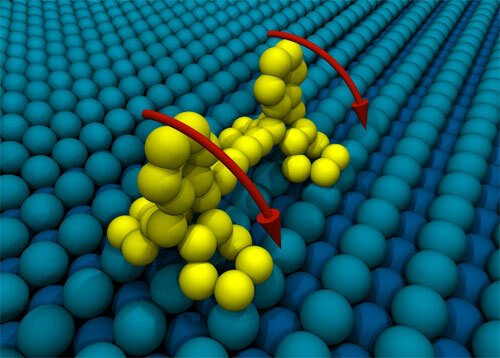 By understanding and controlling how nano-sized vehicles move across atomic terrains, nanoscientists may be able to design a new generation of molecular machines. The STM operator followed real-time on his control screen any variations in electrical current passing through the wheel while he was rolling it. Depending on the handling conditions of the molecule, he could turn the wheels or make the molecule advance without rolling its wheels. "We could also show that hopping and rolling motion can be induced separately in a controlled way from the experimental parameters but in particular from the corrugation of the substrate" says Grill. "It turns out that the surface needs to have some corrugation in the direction of motion in order to enable a rolling motion. On a completely flat surface, the wheel does not roll but hops." The pathways of the hopping and rolling motions are completely different which exactly reflects the different mechanisms. Long pathways can be observed by hopping, but only very short ones by rolling, because there the STM tip is already behind the molecular wheel after a 120° rotation, thus cannot induce any further displacement. Grill points out that a rolling wheel behaves different on a surface than a hopping molecule. "Firstly, rolling allows motion only in two directions – forward and backward but not sideways" he says. "Secondly, it might be possible for rolling molecules to overcome nanostructures or step edges on a surface that cannot be done by hopping molecules." This experiment enables an approach to understanding at the mono-molecular scale the functionalities that are already known at a macroscopic scale. Without a wheel, some technological advances could not function. Similar reasoning is true for molecular vehicles – If the plate of the molecule is not separated from the surface, there is interaction and hence destruction. The future challenges for the researchers are to apply their results to the design of complex nanomachines that really roll on a surface and e.g. transport atoms or are connected to other molecules.